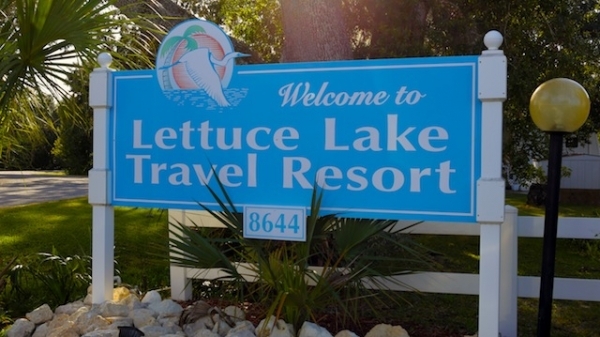 Welcome to Lettuce Lake Travel Resort in Arcadia, Florida. Our location is tucked far enough away from the hustle and bustle of city life, but not too far to enjoy some of the features that our wonderful area has to offer. We find that a lot of our guests enjoy thing like fishing, given that we are nestled right along the banks of the Peace River. We also are located near many golf courses for residents and guests to partake in. We take pride in the fact that our community of residents is very active. We've always got something going on in the clubhouse, whether it's a bingo game, pot luck dinner, Pickleball, or Vegas Night. There is something that everyone can enjoy. Our property has 24 acres, we have 250 lots, and we also offer units for sale and we sometimes have residents renting their personal units.